Every year when I bake Swedish Cardamom bread for our Christmas morning brunch, I wonder why I reserve it for Christmas alone. It is beautiful, relatively easy to make, and tastes so tender and delicious. I love it! 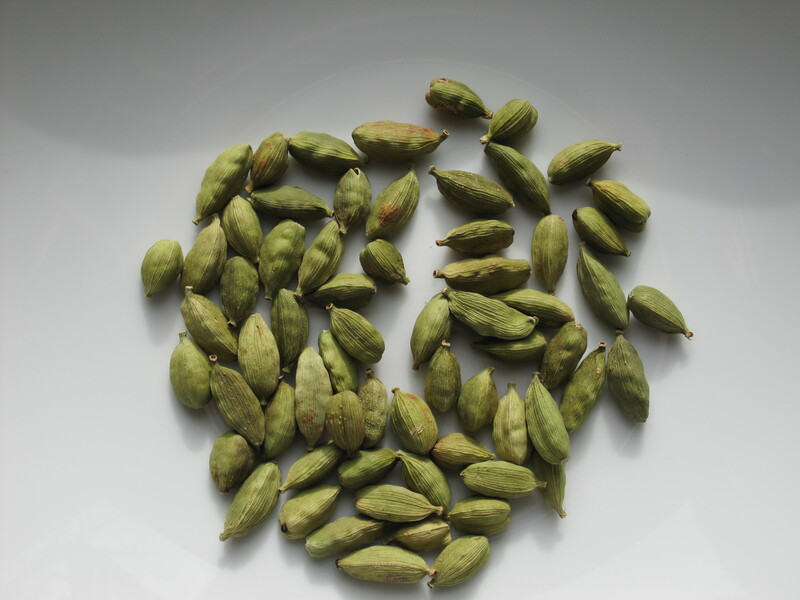 Cardamom is not a spice that gets a lot of play in standard American fare. I know it best through Swedish and Indian recipes. This bread features it prominently. The key is to grind the cardamom seeds just before adding to dough. (Do not use pre-ground cardamom powder, please. It is not the same.) I like to hull the pods, then grind the seeds in a mortar and pestle until they are fine, but still contain some larger chunks (think pre-ground pepper and course pepper ground in your mill for a size comparison). The courser bits add a flavorful crunch when biting the bread. This bread starts with scalded milk that is mixed with butter, sugar, salt, and cardamon. The milk and butter base makes for an exceptionally tender bread. The dough is left to rise and then braided into beautiful loaves that are then topped with Swedish pearl sugar. This can be hard to find, I have had luck at Sur la Table. 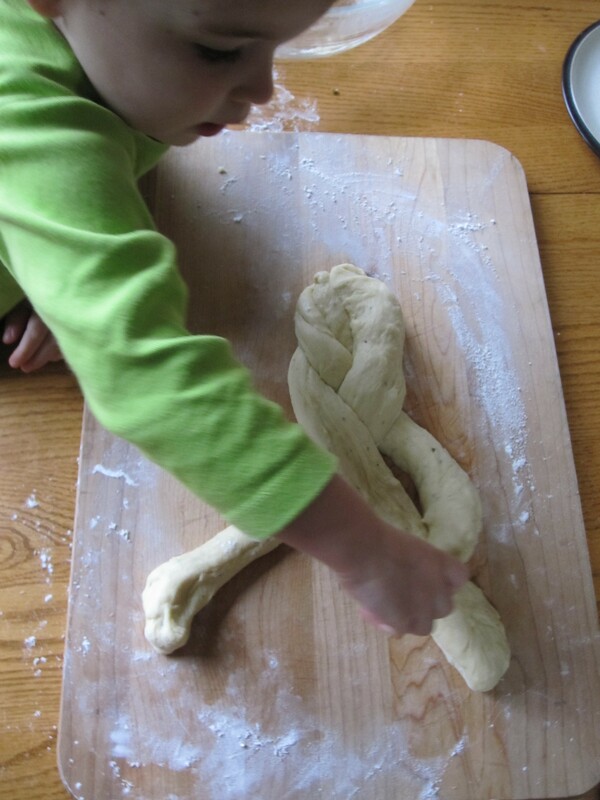 Any sort of bread baking is great for kids, think Play Do minus the Play. Both of mine helped with the braiding and were proud of their results. In addition, my daughter made a Pat Pat and my son a Snowman dusted with snow (sugar). Both were eaten too soon after coming out of the oven for a picture. Combine sugar, salt, and butter in a medium size bowl. Scald the milk and pour over the mixture. Stir occasionally until butter is melted and mixture has cooled slightly. Add cardamom. In a separate bowl, sprinkle yeast on warm water, stir to dissolve. In a large bowl, combine milk mixture, yeast mixture, egg, and 1 cup of flour. Beat well until smooth. Add raisins if using. Add remaining flour until dough is still supple, but not sticky. Knead 5 minutes (or less if you are using a mixer). Remove dough to an oiled bowl. Cover and let rise until doubled (1 hour or so). Punch down and let rest 10 minutes. Divide dough into 6 equal parts. (The key to a nice looking braid is starting with the same amount of dough in each rope and making the ropes the same length and width.) 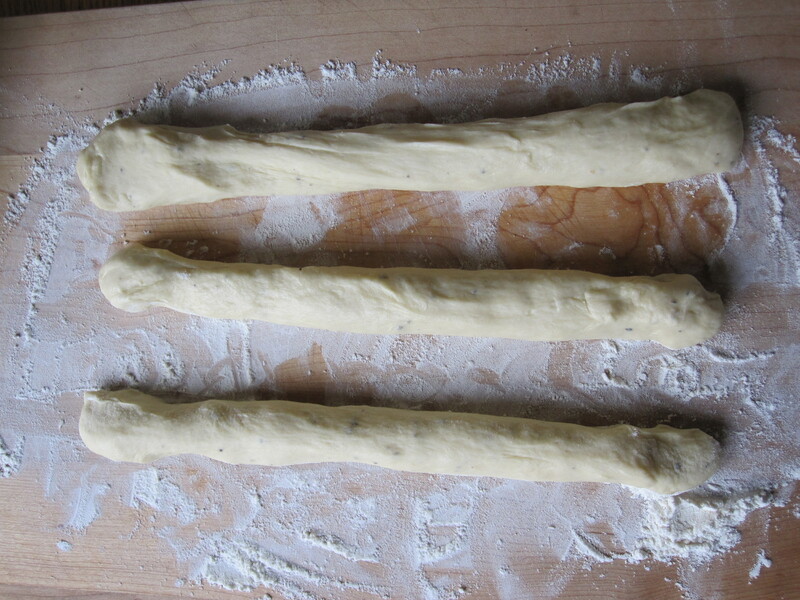 With your hands, make dough balls into ropes approximately 12 inches long. Take 3 of the ropes and line up parallel to each other. Pinch the tops of the ropes together. 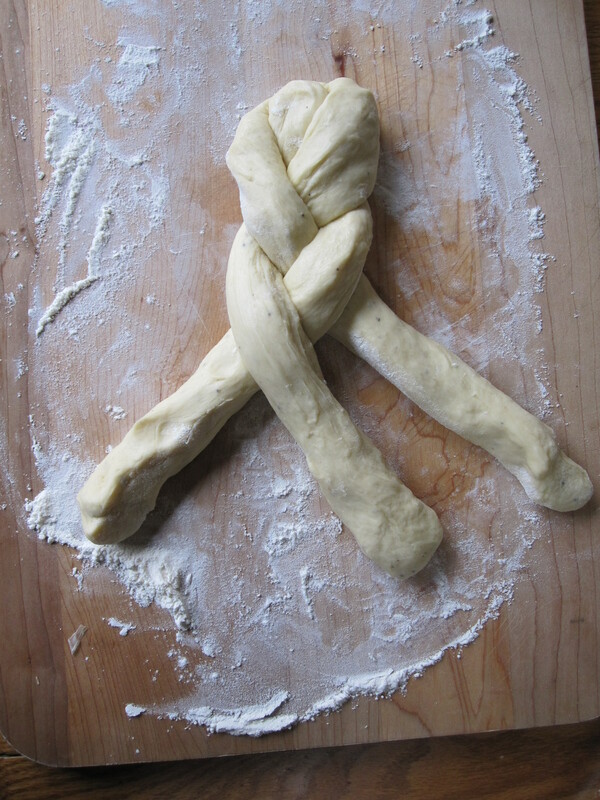 Braid the dough from the top down. When you get to the bottom, pinch together the base and tuck under the bread. (If you don’t like the look of the top of the braid, at this point you can go back and redo the top). Redo with last 3 dough balls. Place braids on a baking sheet, leaving room for them to rise. Cover braids and a let rise 45 minutes. Brush with egg white mixed with 1 tablespoon of water. This will create a nice shiny crust. Sprinkle with the pearl sugar. Preheat oven to 350 degrees. Bake loaves 40-50 minutes. Cover with foil the last 15 minutes to prevent over-browning. Let loaves cool on a rack. Slice and serve with butter. These loaves also freeze well. I usually make mine a few days in advance and keep in the freezer so I don’t have to bother with them on Christmas Eve. Thanks for the feedback, Naomi! Glad to hear you liked the bread. Mixing in some whole wheat is a good idea. Happy New Year! I’ve been looking for a good bread to make for the holidays and this is it! I love anything cardamom. Thanks for posting this. Wishing you and your family a very happy holiday! I hope you enjoy, Suzanne. Happy Holidays to you as well! For this year’s batch, I made the recipe into 3 loaves. 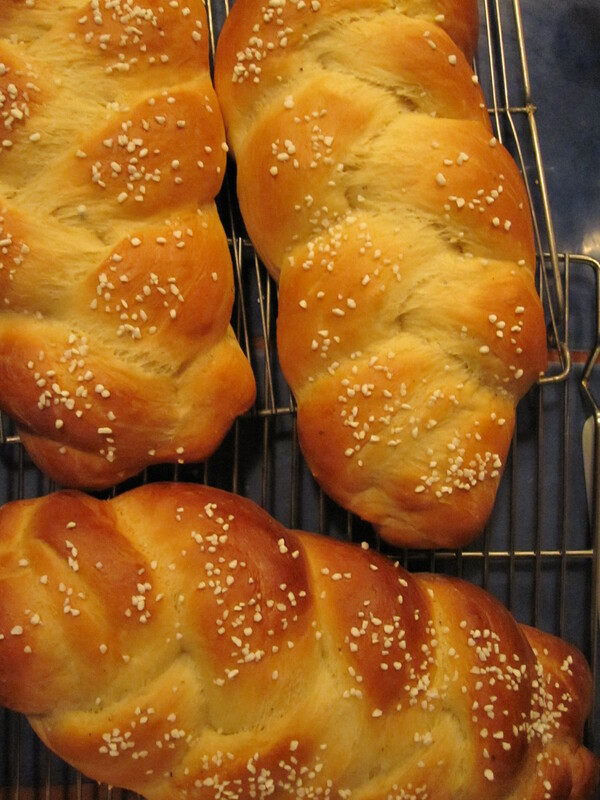 I broke the dough ball down into 9 pieces and made 3 shorter braids. The loaves were done in 40 minutes. They are a nice size for a family breakfast.